Polyphenols are chemicals found in foods that help to prevent the damage of free radicals in the body -- unstable molecules that can damage the arteries and cause numerous health problems. Different types of polyphenols exist, and eating a wide variety of foods will ensure you get the healthiest diet possible. Several studies have been conducted in an attempt to learn which foods contribute the highest levels of polyphenols to our bodies. 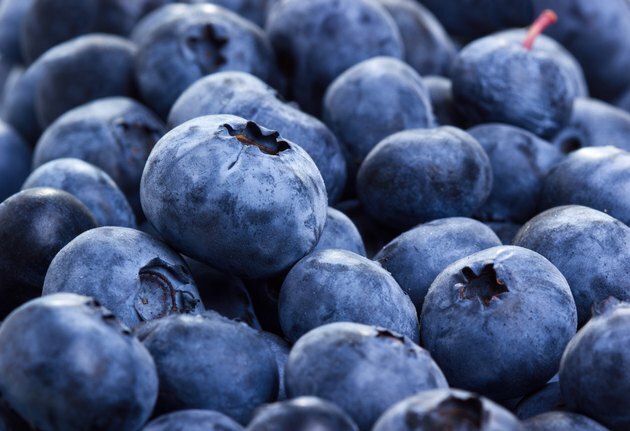 The United States Department of Agriculture lists blueberries, strawberries, raspberries, citrus fruits and other fruits as good sources of polyphenols. A study published in the March 2008 issue of "The Journal of Nutrition" found that dark grapes, bilberries, cherries, apples, dark plums, blackberries and blueberries were all good sources as well. Fruit juices, such as grape juice, contain especially high levels of polyphenols. All fruits contain polyphenols or other antioxidants, and a healthy diet should contain around three servings of colorful fruits each day. All vegetables provide polyphenols or other antioxidants, while onions and potatoes have been proven to be moderate to high in polyphenols. Vegetables should be chosen for their bright color with all colors eaten each week, including red, orange, yellow, blue, purple, white and green. Eating three to five servings of vegetables each day is optimal for good health. Rye and other whole grains found in breads, rolls and cereals contain various levels of polyphenols. Soybeans top the list of beans, while other beans contain minimal to moderate amounts. Peanuts are also listed as a good source of this antioxidant. Several servings of whole grain should be eaten each day, with beans and nuts added several times a week. Several beverages are good sources of polyphenols, with coffee providing the most. Tea, especially green tea, should also be consumed regularly for its high content. Red wine, white wine and cocoa are more good options for polyphenol. Chocolate, seeds and margarine also contain this antioxidant but should be consumed in moderation due to high caffeine and fat content. Food storage and preparation factors can greatly alter polyphenol content. Fresh fruits and vegetables usually contain higher levels of polyphenols than food that has sat around for a few weeks. Peeling food reduces the level of these important nutrients, according to a report in the 2004 "Journal of Nutrition." While cooking food may reduce polyphenol levels, it often raises the bioavailability of the nutrient, allowing us to better receive the food's benefit. What Are the Health Benefits of Flavonoids?